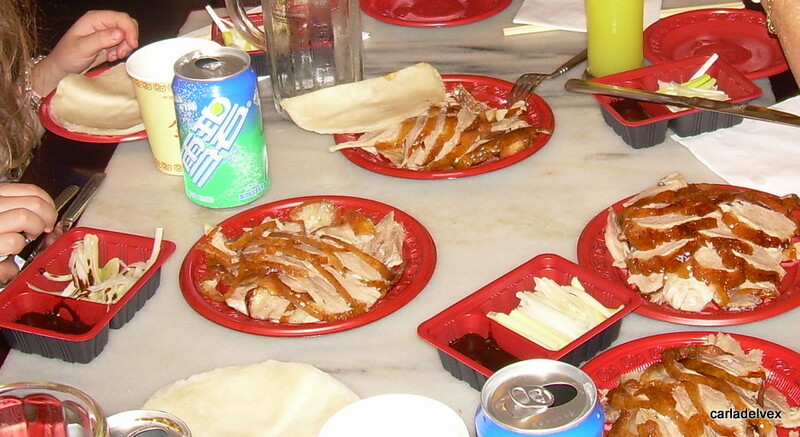 10% Fiction » Blog Archive » beijing roast duck reigns … part four, the final. We stop for a moment to admire the plaque imbedded in the floor—stating that the organization has been operating for one hundred and forty-five years just before a tired looking waitress takes over from clipboard man and ushers us into the main room. Where were the white linen table cloths? The kids slide onto the wooden bench seat and grab at the laminated menus. At the opposite table a waiter is busy doling out portions of duck to an expectant crowd. It was all served on red plastic plates. The famed duck bone broth is handed to the hungry customers in Styrofoam cups. On top are plastic, sippy lids. My son hands me the dripping umbrellas while my daughter happily points at the colourful pictures on the menu. My husband has already ordered a beer. As I reach to find a place to stow the umbrellas I feel a squelch under my foot. I look at the bottom of my shoe; a discarded piece of duck has left a big grease stain on my sole. I see my husband half jogging up Queen Street; he’s trying to protect his glasses from getting wet by crooking his arm over his head. “Why’d you bring me here?” I ask. I take his hand and purposefully pull him back under the restaurant sign and out into the drizzly Melbourne rain. We walk up Queen Street in the direction of the parked car. He is bewildered. “I know, I know.” I tell him, trying to find the words to explain. “But the food was. Just. Delicious.” I say.